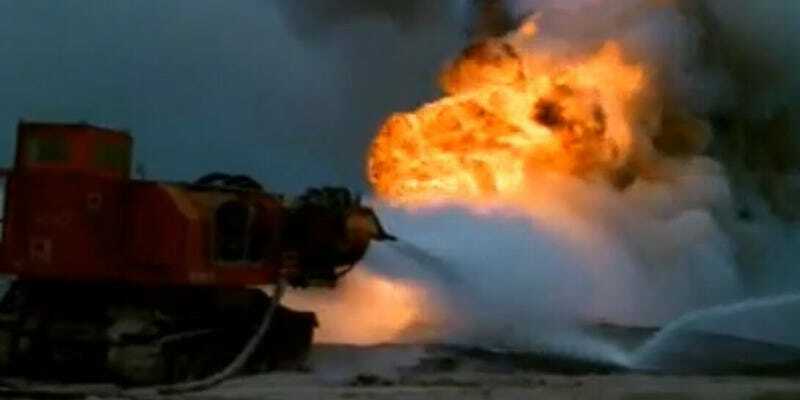 As the post-conflict cleanup from the first Iraq War demonstrated, oil well fires are nearly impossible to put out without taking extraordinary measures. Luckily, this extreme measure is both super effective and totally badass. It's called The Big Wind. Designed by a team of Hungarian engineers originally as a means of mass decontamination for Cold War-era tanks in the event of a CBRN (chemical, biological, radiological and nuclear) attack, this fire-fighting chimera has found a surprising niche in the modern world: putting out oil well fires like overgrown candelabras. The Big Wind is one part T-34 tank and two parts MiG 21 jet engine. Specifically its a T-34 tank chassis with a pair of Mig 21 jet engines mounted to its roof. A pair of operators are responsible for maneuvering the tank chassis into position while a third, external operator controls the jet engines.